Misalignment is a fact of life in powered thread verification. You can’t avoid it. So how do you prevent, in real life, having the thread gage member jam in a good thread because of misalignment issues? 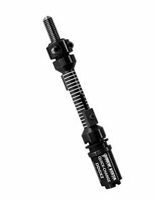 New Vista’s patented torque control mechanism prevents damage even when misalignment is a factor, but for the thread gage member to slither effortlessly through a misaligned thread, you will also need a compliant Toolholder. And in cases of severe misalignment, only a SuperCompliant Toolholder™ will do the job. Ordinary floating tapholders, of the type used in tapping operations, are not suitable for this kind of work; their use will result in stalling at entry, metal adhesions or out-of-phase rethreading. A properly designed compliant toolholder will, in contrast, allow the tool to make effortless entry 100% of the time and permit the tool to glide easily through any correctly-sized thread. They will work with a large variety of powered thread-verification and thread-chasing Units. They eliminate jamming, cross-threading and, in high torque applications, off-axis re-cutting resulting from misalignment between the tool and the threaded feature. They will find and follow threaded holes (or external threads) that are out of position up to 5mm (Ø10mm true position); or out of square up to 3º. They have a high torque rating due to sophisticated Oldham principle design. They can be repurposed for new applications in a matter of minutes. No disassembly or shims are required. There are several different variations in the SuperCompliant™ family. You don’t need to be an expert in thread verification techniques to decide which one to choose. Contact a New Vista Applications Engineer today for more information regarding the New Vista line of Compliant Toolholders. Applications service is available from New Vista’s Baltimore, MD (USA) location and in several other countries as well. Please inquire.